Since 1992 Wicken Fen has been dedicated to producing high wquality and tasty foods. 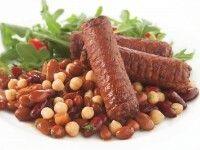 We produce a delicious range of products created for you to enjoy! We have come up with some tasty ideas using our Wicken Fen range. 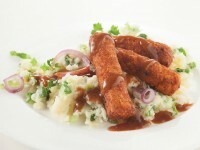 If you have your own family recipes that you enjoy making using any of our products please get in touch. We would love to hear from you! Perfect for serving with salad and flat breads. 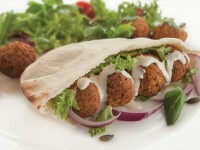 Delicious in Pitta bread with salad leaves and topped with a yogurt sauce. Delicious with creamy mashed potato and vegetarian gravy, or why not cut into chunks and use in ragout. For a hearty pasta dish, why not slice into pieces and add to a tomato sauce. 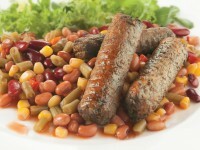 Delicious served with mixed beans and a fresh salad. Lovely with a fresh salad, or why not slice and use in stroganoff. 2) Brush the whole square with egg. 3) Slice the Cambozola and place in the centre of the puff pastry, cover the cheese with sliced mushroom, then top with 2 Wicken Fen sausages and finely top with sliced cherry tomatoes. Salt and Freshly ground black pepper. 4) On an angle cut the pastry on each side up to the filling so you can plait the pastry over the filling. 5) Brush the whole en Croute with beaten egg and cook in oven 170C/325F/Gas 3-4 for 15 minutes. 6) Serve one each with salad. The melted Cambozola against the dry pastry is delicious! Serves 2 but from your 500g pastry you could get 4, double up the filling ingredients. 1) Cut the red pepper in half and remove seeds. Place on a baking dish. 2) Fill the pepper half, with Wicken Fen sausage slices, cherry tomatoes, and olives with no stones, drizzle with olive oil, add salt and black pepper. 3) Top with a generous slice of goats cheese. 4) Cook in hot oven, 170C/325F/Gas 3-4, for 12 – 15 minutes until the pepper is cooked. 6) Serve 1 pepper half as a starter or 2 halves as a main course with salad and new potatoes. ¼ red chilli chopped, not the seeds. Fry the chicken in a little oil to brown, add the chopped pineapple and fry for 4 minutes, add the Wicken Fen Honey, red wine, and chilli, put the whole dish in the oven 170c for 15 – 20 minutes until the chicken is cooked through. Mix honey, sweet almond oil and essential oil of rose together over a little heat if necessary. Massage onto face, neck and hands, relax for 20 minutes. Rinse off with luke warm water and gently pat dry to reveal a fresh soft complexion. Grill the eggy bread or place in the toaster until hot. Spread a thin layer of Philadelphia cheese on the eggy bread. Top with smoked salmon and capers. Place a quarter of lemon on each plate. Serve with freshly ground black pepper.